Through a chain of events that Dave describes as fortunate, Beltway heard about CoreXpand as a trusted PunchOut provider for other Commonwealth suppliers. So when CoreXpand reached out as part of a SWaM initiative (for Small, Women, and Minority owned businesses), the opportunity was too good to pass up. 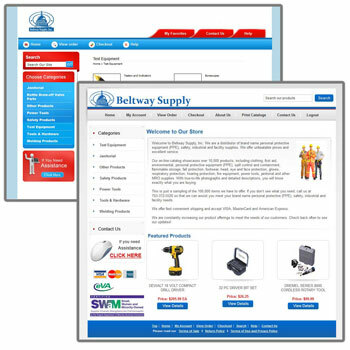 Incorporating CoreXpand's PunchOutCX product, Beltway Supply has created a PunchOut catalog that enables them to truly separate themselves from their competitors. Now, says Dave, we're one of only (roughly) 150 vendors out of 54,000 who have a Level II PunchOut catalog. And it's opened up a lot of doors for us. According to Dave, those doors have opened largely because of the credibility that having a PunchOut catalog provides. Dave's experience is typical of other suppliers that reach out to buyers who use e-procurement systems. Because PunchOut catalogs make it easier for buyers to get the information they need, Do you have a PunchOut catalog? is a common first question from buyers. "Now when we call a Commonwealth buyer on the phone, we're already over that first hurdle," explained Dave. "In fact, when we meet with them now, they often already have our PunchOut catalog up on their screen. Now we have something to talk about besides just trying to show and tell our product line." The doors that have opened because of having a PunchOut catalog have led to some amazing opportunities. "Just this morning", shared Dave, "we received a phone call from somebody I talked to a month ago. She wanted to buy a bunch of stuff from us because of that PunchOut catalog." "Last November/December I went to a community college 300 miles from my office. It was an area I targeted for some cold calls. I'd been having a hard time reaching the Purchasing person for this college, and was running out of time. I only had a couple hours left in the area, so I found a parking spot across the street from her office building, and finally got a hold of her on the phone. I introduced myself and Beltway Supply, then told her I had a PunchOut catalog. She stopped me, 'You have a PunchOut catalog?' And I said, 'Yes'. She immediately said, 'Can you come up right now? I need to talk to you.' Well, that conversation led to a $150,000 a year client. And having that PunchOut catalog gave us the credibility we needed. The purchasing person even told us, 'There are 50,000 vendors in the eVA system (at that time), and you're one of only 148 vendors out there that have a PunchOut catalog. You know what you're doing with procurement in the Commonwealth of Virginia."